You can create custom user interface elements that derive from FrameworkElement. 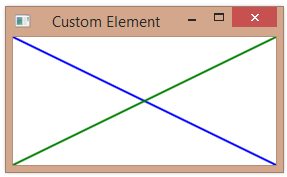 Below is a simple example that renders itself as a graphical “X”. We override the OnRender method (inherited from UIElement) and use the DrawingContext object to create visual content. If we host the Grid as a top-level element in a Window, our element is sized to fit the Grid, which sizes to fit the Window. Because we render the element using ActualWidth and ActualHeight, it changes size as we resize the window.